SRCoin is created with an account receivable as the underlying asset, which occurs when customers purchase subscription plan for K Rental products. In other words, the cash flow of the account receivable is the value of SRCoin. The account receivable represents the cash flow generated from the 5 year subscription contract’s monthly fee. Key Advantages of Subscription Business? SRCOIN is made so that the accounts receivable from subscription payments that customers pay for the products rented serve as the underlying assets. In essence, the cash flow from accounts receivable will be the underlying assets that support the value of SRCOINs. cash flow that results from it. 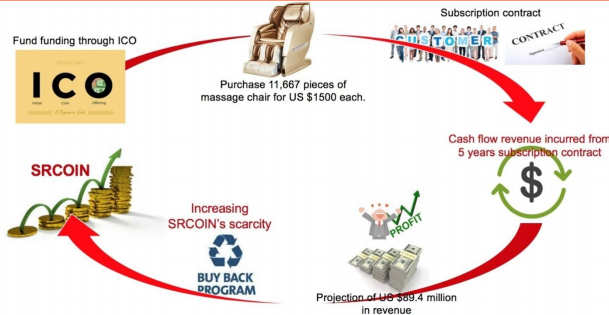 The funds raised from the crowdsale of SRCOINs will be invested in K Rental, an already established company, and its project for starting the massage chair subscription business. Hence, there is fundamentally no risk of business not proceeding, meaning safety of investment and stability is guaranteed. Also, for the first 3 years, 20% of the profits that result from the massage chair subscription business will be returned to ICO contributors in the form of Ethereum currency. And over next 6 years, the amount of SRCOINs in circulation will decrease by ~81%. After 6 years, only ~19% of SRCOINs will be left in the market. All health information shared with government and medical institutions will require customers consent, and the customers can decide to consent with the information collection and usage when they enter into subscription contract for message chairs. Through our health platform app customers will be able to closely monitor their own health and immediately send required information to medical institutions if needed. This will lead to a decreased medical expenses and an increased efficiency in maintaining ones’ health .Through more effective adult preventive care using time series health data, government spending can be decreased by more than 30%. Bounty campaigns will last until the end of SRCOIN ICO. The rules of each bounty pool are different, the sizes of the pools are different, and points do not carry over from pool to pool. PLEASE READ ALL RULES CAREFULLY.